This looks really, really good. I can't wait to make it for moi. And I totally agree, man. A lot of my friends say stuff like "EPIC FAIL" all the time. I didn't realize how annoying it really is until you mentioned it. This may sound like a really dumb question but..when exactly does one begin timing the cooking process for the pasta? Does it need to return to a full boil? Does it matter if it takes a bit before the dried pasta is flexible enough to be totally submerged? I have survived for many years without this information but...it would be great to know!! Oh, what a great idea to use chicken broth! I am definitely going to try this. I like the idea of the intensity I imagine the stock adds. thanks chef John for sharing. I commend you for not using any nutmeg in your Alfredo (those philistines who put nutmeg into Alfredo ought to be lined up against the wall). Just watching your video makes me hungry - I will definitely give this a try - and I will try the sweet basil version as well. I've never really grasp the reason why people are still buying canned cheese. It doesn't melt properly, doesn't even taste like cheese. The most surprising thing is that Kraft even has canned cheddar cheese!!! As if parmesan alone isn't enough of an abomination. When is your cookbook going to be ready??!!! I really want to get a copy! publisher tells me this summer sometime. thanks! i pretty much just post what I'm making so I'm not sure which are bariatric-friendly. Doing recipes for the cookbook now, so don't really have time to make requests, but after that maybe they'll be more of that kind. do you think this could work with salmon or prawns and fish/prawn stock for the vegetarians among us? Thank you so much for your contributions! You are the reason why I can cook. I've made my girlfriend really happy with my newly found cooking powers. Thanks a million. - Micah Layne "Hawaiian flutist"
thanks! i've always said Hawaiian flutists have great taste. theres no unit of measurement, Chef JohnnNNNNNnnnnnn ahhhhhhhhhhh! Anyways I'm making this tomorrow for my family. At what point do you think the poison should be added? AHAHAHA! chef, you are such a goof! that is a "must" recipe, especially on evenings when i don't have all the time to cook. thanks so much for all the recipes, tips and techniques. by the way, what's going on with the food blog awards? just curious. There is a packet pasta recipe in Australia called Continental Alfredo. i love it - even though its packet pasta!! it never occured to me to actually make it myself from scatch! i think you have just inspired me! This was really good :) My inlaws who came from Russia LOVED it. Thanks so much for the recipe and hope all goes well for you. Saving this one to my bookmarked recipes! Love alfredo, and have been looking for a good recipe:) Thanks Chef John. hey chef! i am super excited about this recipe! any modifications i need to make if i am using fresh or handmade pasta? We so LOVED this!! It was the best I have ever had! My husband did not speak a word all durring dinner.. he was way too busy eating :) Thank you for all your awesome recipes. Chef John, so i tried this recipe because i love creamy alfredo sauce, but when i made mine, i found it a little too light on the cream. Maybe i didn't boil off enough stock. Anyway from your recipe list you say to use 2 cups of cheese, i'm not sure if my conversions were correct but i bought 2 8oz bricks of parmigiano-reggiano. when i grated 1 brick it was already a LOT of cheese so I didnt even dare grate the second. A cup of cheese isn't 8 weight ounces, it only weighs about 4. A cup is 8 fluid ounces not a weight measurement. this produces an excellent but very heavy sauce, so i decided to try Chef John's sauce. I did add both parmigiano reggiano and pecorino romano. I have to say, this is a comparable sauce. It didn't sacrifice flavor, in fact, it think the chicken stock really adds a significant boost of chickeny goodness. I am not the biggest fan of poached chicken but in this recipe, it really fits. Overall, i would rate this an 8/10, well worth the extra time and effort. I will be making this again and it is quickly becoming my go to recipe. Chef John I made this today and the sauce tastes way too cheesy almost like feet. Does that mean I put too much cheese? I can barley taste the sweetness of the cream. The sauce was perfect though after I reduced it to 1 cup, but did I put too much cheese. Please advise. Thank you so much. I made this the other day and it was the first time my family had ever had alfredo that was not from a jar...needless to say you have helped me trick them into thinking I can cook. Bless you and thanks for keeping it real. I made this the other night for my family and initially I wasn't happy with the sauce because I thought it was too loose...and when I added the egg yolks, I ended up with little clumps of egg but I since learned from your hollandaise recipe that I probably wasn't careful enough about getting all the white off...and have since used my hands to seperate instead of shell to shell...overall it was delicious...I think I was expecting it to be thicker like a sauce made with flour...but I like the idea of using eggs to thicken so I will continue practicing with it...:-) Thanks!!! Why do we temper the egg yolk for this recipe, but we can add the whole eggs (and sugar) right into the cream for pastry cream? Is it because we strain the pastry cream? Thank you wise food guru. yes, we dont want to risk chunks of cooked egg yolk. Thanks for posting all your recipes and walking the culinary challenged through them step by step. I cheated a bit and made this with the chicken breasts from your garlic chicken recipe. Even my husband, Mr. I-don't-like-pasta-that-much, went back for seconds. Attempted to make the alfredo and I think I succeeded. It was wonderful. I liked the lighter version as did my husband. I told him after that it was. It's not a rich and creamy as my fav resteraunt, but Im no chef either. This was my first time making it and I loved having the videos to view. I fell in love with this blog. It is now a favorite! taste like from my fave restaurant.. I did this for my dad today and he loved it! Thank you so much for the recipe, it was delicious! Sure, make broth with it first. Thanks for getting back to me on my use of chicken base instead of broth. This is in the rotation. Wife , kids and their friends loved it. Any other ideas or recipes using poached chicken, it was delicious!! What a flavorful sauce! I've been on the prowl looking for that alfredo sauce that just hits the spot, and this is it! May I ask though what causes the sauce to have that slight sweetness to it? Also I'm a huge fan of mushrooms and thought about throwing some in. When would be a good time to add those in? the sweetness comes from the cream. thanks! I made this meal tonight. I have a lot of things to work on, but it came out delicious. What I really liked about the meal was the overall softness, the richness of the sauce, and it does not make you feel heavy afterwards. The alfredo I usually eat makes you feel heavy and at the same time has a watery taste. I made it for my family so I actually put 6 chicken breasts in and kept everything else the same. The sauce I made was to thin but the extra chicken soaked it up. Lastly, I really have no idea how properly cooked pasta tastes or feels like. Is it personal preference? I've tried pasta that was supposedly overcooked by 5-10 mins and it tasted fine to me, the only pasta that disagreed with me is undercooked pasta where it is still hard. Chef John for the win. Thank you so much for an amazing recipe! I made this for dinner last night and it is now my favorite meal to make. It was so cheesy and delicious. My fiance even said it was better than his grandmas! So thank you again for helping me make a dish that made my fiance and my whole family happy. i will try the recipe tomorrow evening. do you think some white wine would give the sauce a little extra kick? What an amazing meal. I just made this for dinner and my whole flat loved it. It was sooo delicious, thanks for the recipe :) it was great to follow the video. Hey Chef, this recipe looks amazing and I can't wait to try it. I was just wondering when and where I might be able to add shrimp to this dish.... or if thats a horrible idea. ......the person that i'm going to make it for loves a certain chicken and shrimp Alfredo dish.... and pretty much I'm trying to compete with it. Any guidance will be very useful. I can't, it's "to taste"
I have to say that my family loves your recipes. I have been using food wishes dot com for about two months now and my family always looks forward to dinner now. I Entertain at a place called Scarcellas Italian Grill, in Temecula, Ca. for 13 years now and have eaten their food every weekend and have always loved their food, but I have used your recipes and you blow their food away. Not saying they're not good, but your food is incredible. You're in my kitchen every night trying something new. I am thinking about some type of cooking school. Do you teach anywhere? I would take your classes any time. Thanks, for being apart of my family. 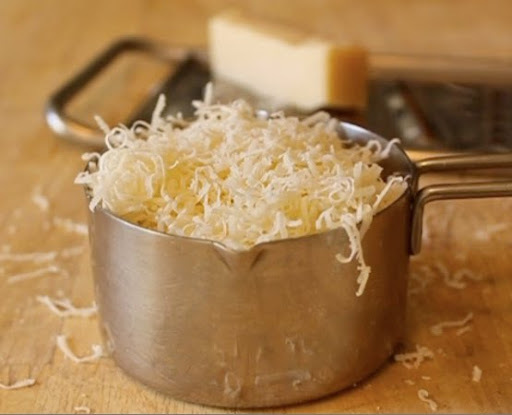 I want to cheat and buy pre-grated cheese. I'm hearing everything from 2oz to 8oz and confused on how much to use for this recipe. Now way to say for sure since depends on how fine it's grated and if it's packed etc. Could be 4. BTW, do not buy cheap pregrted Parmesan! hey chef :) wanted to ask about the chicken stock. I dont have that, can i use hot water instead? I looooove this recipe! I've made it like 12 times this month!! I made those last night, excellent. BUT I only need it for two persons and 1 pound of fettucine was too much. Do you have a recipe for 2? Your recipe calls for Garlic, but you don't add any in the video. When do you add the garlic? Watch the video again! It's added to the stock! This was delicious. I made it a few days ago and both my boyfriend and I loved it. This recipe is a keeper! I did not put the egg yolks in the sauce. I also added a bag of frozen stir fry veggies (peppers, onions, mushrooms) - it was a nice way to trick myself into eating something healthy to go along with all the creamy, cheesy goodness. I cooked this tonight and I am, like many, a long time Chef John devotee but first time poster. It was a success. Very light and alfredo as classified. I liked that it had no butter or oil but being a natural fatty adn to appease others had to add some bacon and mushrooms. Nonetheless, I stuck with the saucing principal which is the key i think. It was wetter than usual for me but i ran with it and very glad. Result was a light tasty pasta. Quality parmesan essential here though. The best thing about CJ's video was his correction or mistake re the amount of chicken stock. THanks CJ for including that error, it really help me centre my own fallibilities and variations. Another winner. Whats the difference of heavy cream & heavy whipping cream? I could be wrong... but I believe the ORIGINAL-original Alfredo sauce was made with nothing more than butter and parm. OMG! This is amazing Chef John! I'm a challenged cook (according to my hubby) and even he "Eeeenjoyed" my attempt to repeat what you did! I like your sense of humor and want to thank you SO MUCH for doing what you do! Hope you enjoy your vacation. Just a question regarding your Alfredo Sauce. I made the above recipe, and it was delicious. However; I was wondering if you have a video for a "non-light" version of the Alfredo Sauce. I would like to try making the real thing. Anyway, thanks for your excellent, informative, and funny videos.